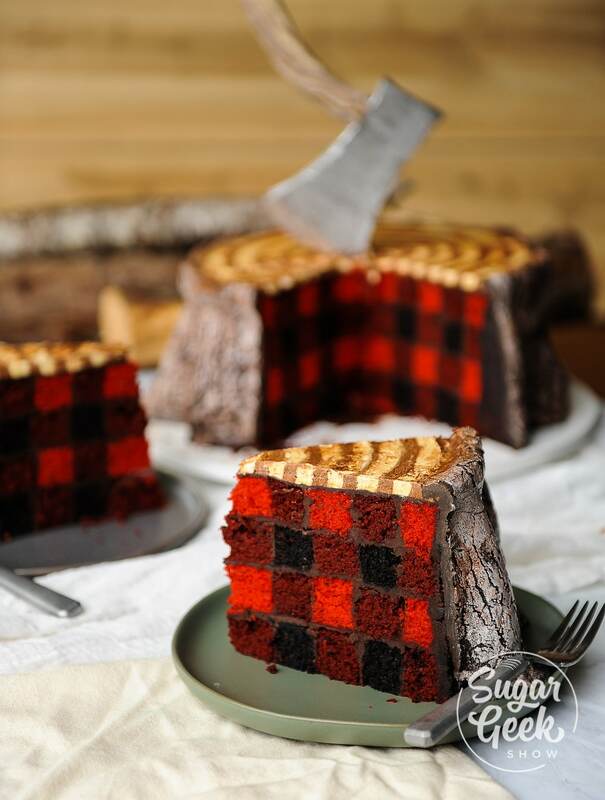 How To Make A Lumberjack Cake With Buffalo Plaid Cake Inside And A Gravity Defying Chocolate Axe On Top! 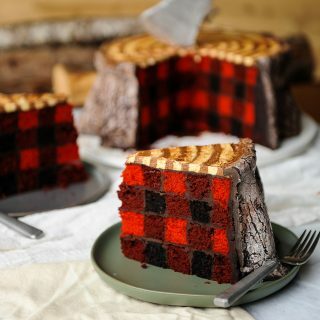 The lumberjack cake is probably my favorite cake of all time. 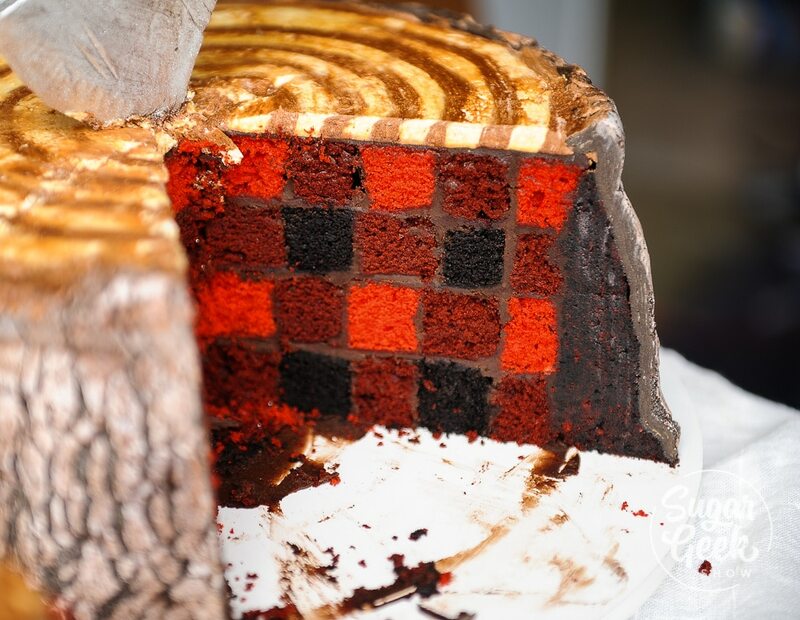 What happened to be a random experiment to see if I could make a buffalo plaid pattern inside a cake became a viral sensation! Three years later, it’s still my most popular tutorial and now you can learn how to make it for free! This tutorial is an updated version because I felt like I could improve upon the original design but you can watch the original lumberjack cake tutorial for free too! If I HAD known this cake was going to go viral, I definitely would have taken the time to finish my board *cringes). My video quality at the time was a GoPro and some of the techniques where a little fussy. Since then, I have made dozens of lumberjack cakes and have streamlined the process to what I feel is a pretty simple and fun cake to make. I also have three new recipes for you that I like to call the “Sculpted cake recipes series” which are cakes that still have a lot of great flavor but are a little bit sturdier for using in carved cakes like this one. My original cake tutorial used box mix which is really tender and breaks pretty easily. Since then, this cake has been made and re-made by some huge pages including tastemade which used to bother me but now I just know it’s part of this business. But the thing that REALLY get’s me is that the plaid is never true plaid in any of these other videos. It’s my inner OCD going nuts. 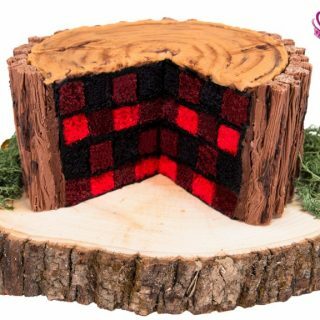 To create the plaid texture in this cake, you have to make two 10″ red velvet cakes for carving, two 8″ chocolate cakes for carving and two 10″ yellow cakes for carving (dyed red). You will have a little cake leftover after stacking. I HATE wasting cake so I added some roots to the design that uses up the excess cake and I think gives it a fun tree stump look. You can see the layer of yummy cake clay around the outside edge which tastes a lot like fudge! Yum! 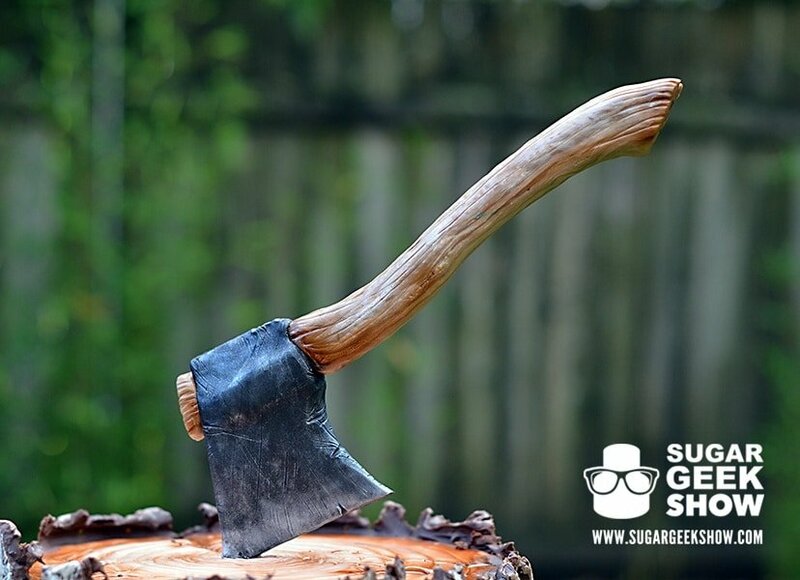 So after much discussion with my husband, we have decided to not only release the original lumberjack tutorial to be a free video, we have also made a NEW updated version with a different style of bark texture that I think is a lot more realistic, simpler way of making the edible axe using my modeling chocolate recipe and even a simpler way of making the wood rings on top using buttercream instead of fondant. You can use the old bark texture if you like or the new one depending on how much you enjoy working with fire haha. The new bark texture is created using my LMF fondant recipe and my crackled fondant technique with the addition of some granulated sugar for extra crunchy texture. I get asked a lot of the fondant has a “burnt” taste because of the torching and the answer is no. We’re only caramelizing the sugar like you would a s’more since the fondant is made mostly of marshmallows. The crunchy outer layer of sugar combined with the marshmallow fondant and the ganache underneath results in a cake that tastes literally like campfire marshmallows. How freaking lumberjack is that?? Seriously though, I might not be okay. I have a slight addiction. Well, slight would be an understatement really. Is there a word for a plaid obsession? I think it’s taking over my life! Plaid themed Christmas cards. 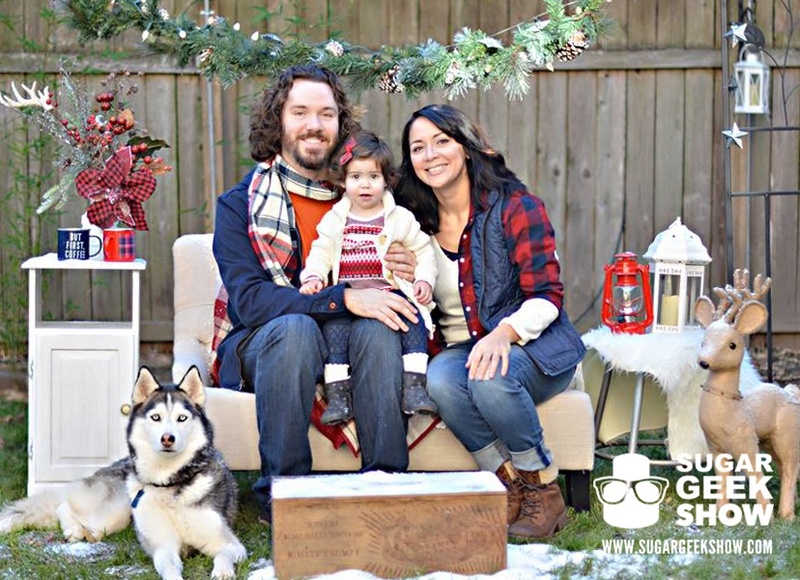 I get bonus points for getting the dog and the baby to look at the camera. 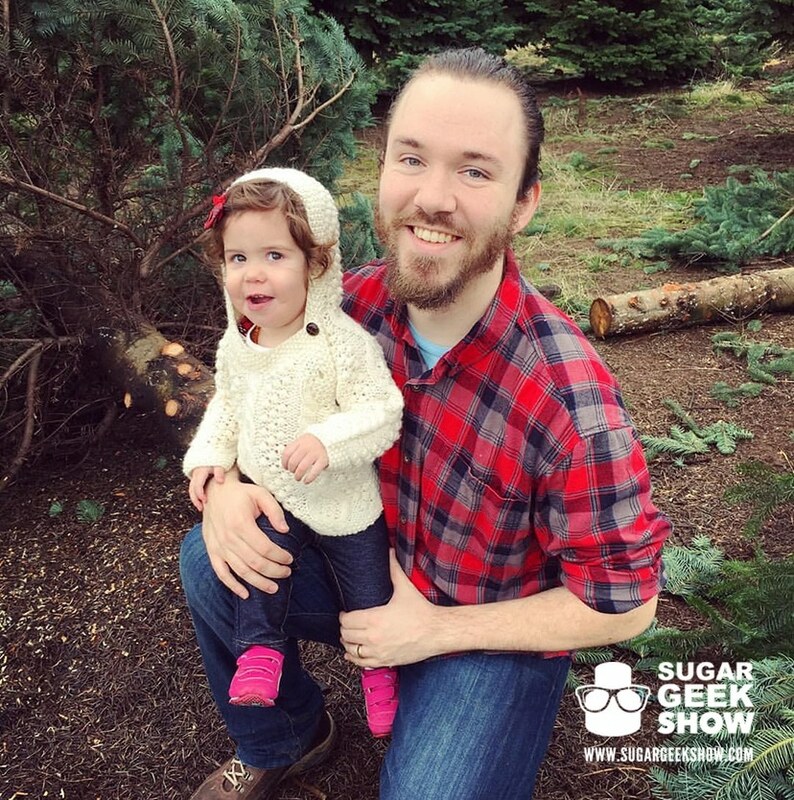 My hubs might very well be a lumberjack… oh my. I mean he DID technically chop down that Christmas tree. That counts right?? What is a lumberjack cake? 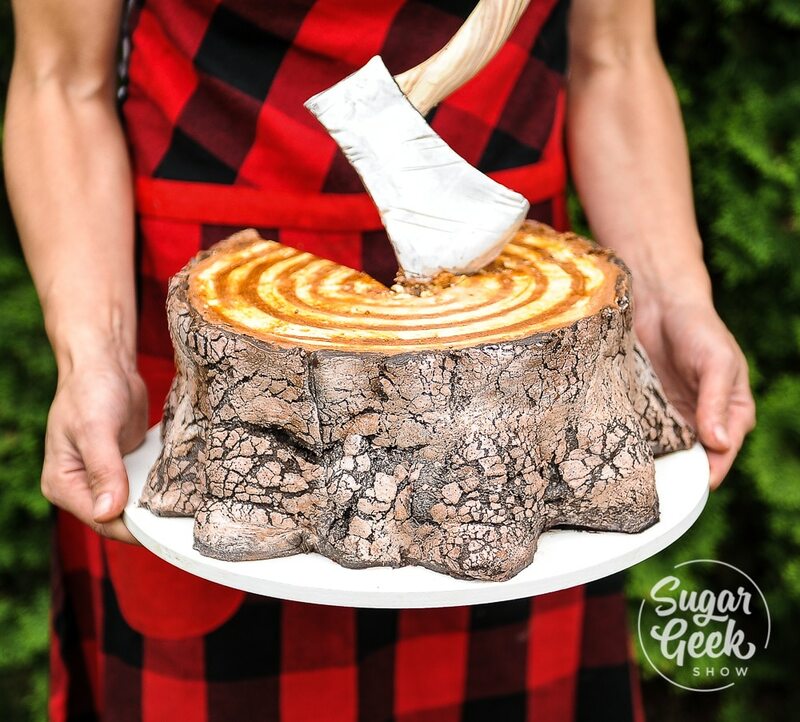 A lumberjack cake could be many things, if you search pinterest you’ll find a whole plethora of lumberjack cake versions ranging from cute stacks of pancakes to beards, bears and suspenders. My version of the lumberjack cake was actually a very quick experiment that I didn’t really think anyone would think was that interesting. I kept seeing plaid everywhere and I couldn’t help but think… could you make a cake plaid on the inside? Maybe it’s because I’m an Oregonian. Maybe because it’s the hottest trend on Pinterest right now. It could be because I have a crush on #FashionSanta and I know his favorite color is plaid. Or maybe it’s because I’m a child of the 90’s and if I start wearing mauve lipstick and JNCO jeans, someone please send help. When hubs chopped down that Christmas tree all lumberjack like, my obsession with plaid became clear. I’m in love with lumberjacks. It makes sense: I love trees, I love beards, and I love plaid. 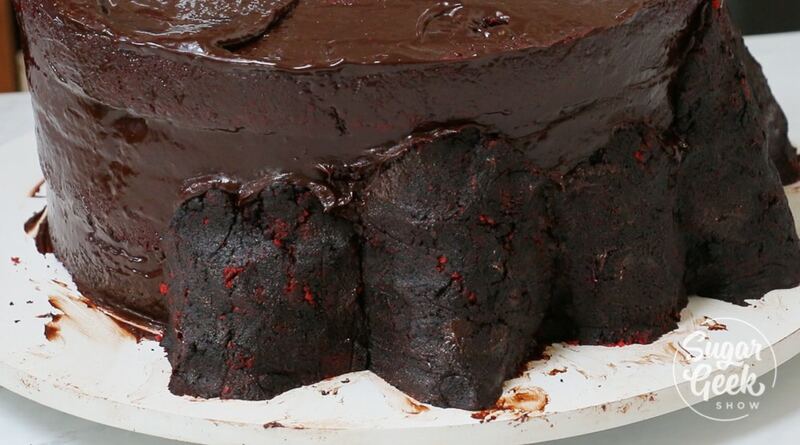 This lumberjack cake is a culmination of almost all my obsessions. If I could have worked in a mermaid I would have. I would like to say this pattern was super simple to make but well… let’s just say a lot of cake and a lot of scribbled notes ended up in the trash. Damn you maths! Why must you confuse me so?! Ever measured a piece of cake with a ruler and a compass? 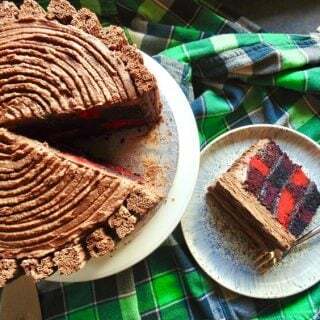 Neither have I… Only crazy obsessed weirdos would go to such extremes to perfect the perfect plaid cake masterpiece! I know that plaid is kind of the show-stopper but f’real, this tutorial is the real deal. I got all kinds of cool stuff packed in here: airbrushing, modeling chocolate, fondant, hand-detailing and of course, crazy realistic textures! It’s kinda my thing. This chocolate bark on the outside of the lumberjack cake is one of the easiest and most realistic textures I have made, not to mention tasty! Yes, that’s edible. I know you where thinking it and It’s ok.
Is there a magical plaid pattern cake pan? Be aware, there are many copycats out there who claim to have the right pans or easy ways of making this plaid pattern but I dunno about you but random squares of colors on the inside of a cake does not make plaid. Trust me, it took way too many brain hours to figure out exactly how to make this plaid pattern work so that when you cut into it, it really would be plaid! 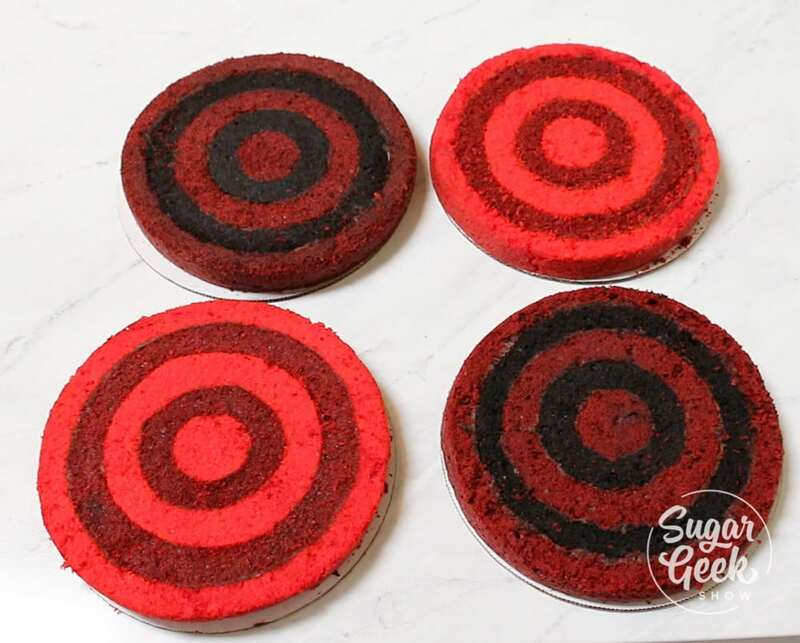 There are cake pans out there made for making a checkerboard pattern on the inside of cakes but these may not work the way you want for making a true plaid pattern. The reason is there aren’t enough rings to make the full pattern. First you’ll want to bake up your cakes. You’ll need two 10″ red velvet cakes, two 10″ Bright red cakes and two 8″ chocolate cakes (recipes below). You only need your layers to be an 1″ tall so I fill my 2″ tall cake pans with batter about half way then trim after baking. I prefer these recipes because they hold their shape when you carve. After baking I wrap them in plastic wrap and chill them in the fridge overnight before carving. After you bake your cakes, you’ll want to make your ganache and your marshmallow fondant (LMF) or you can use any brand of fondant you prefer. I like to make my own so that I can color it a nice dark brown. I use the same technique as I do in my black fondant tutorial but use brown food coloring instead of black. You’ll need an 8″, 6″, 4″ and 2″ round template. I used a mixture of cake boards, pans and cutters that I just had handy. Cut out your circles with a utility knife, making sure you cut straight down so your cake layers have straight sides. You’ll need two sets of red velvet/chocolate cake and two sets of bright red/red velvet cake. Make sure you glue your layers together with ganache or they will fall apart when you cut into them. Buttercream doesn’t seem to hold as well as ganache. 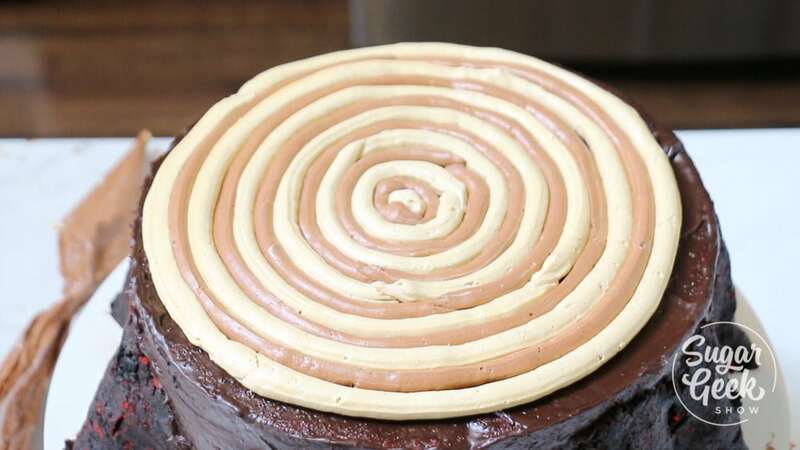 Stack your layers starting with the red velvet/chocolate layer on top of a 14″ cake board. I like the boards from cake boards avare because you can clean the surface as you work. More ganache in between then give it all a good crumb coat and put it in to the fridge to firm up. While it’s chilling, go ahead and make your modeling chocolate axe. First you’ll want to make your modeling chocolate. I made a batch of ivory and a batch of dark brown. For the support, I’m using 1/8″ armature wire which you can buy in our shop. This is the same wire sculptors use for making clay sculptures so it’s flexible but strong. You’ll also want some aluminum foil tape to cover the wire and make it food safe. I buy mine from home depot but you can also get it online. Some silver dust to paint the chocolate works great too. First roll out your brown modeling chocolate into a wedge. 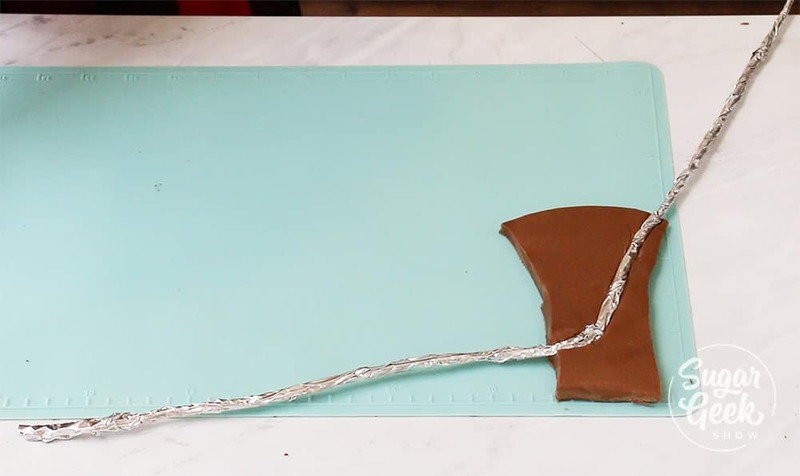 Cut into an axe shape.Cover the wire in aluminum foil tape. Bend your wire so that it has a long part that comes out to form the handle and the other part goes through the front edge of the blade. This is where the wire is going to come out and then go into the cake to make it look like it’s stuck in the cake. Cover the other side of the wire with a thin layer of modeling chocolate and cut off the excess. Take your ivory and leftover brown modeling chocolate and marble. Roll into a snake and then cut a line down the center. Place the wire in the cut then fold the modeling chocolate round the wire and smooth the seam. Place into the fridge to chill until firm. After the cake is chilled, I make the tree rings on top using some easy buttercream colored ivory and brown. I used two separate piping bags and pipe alternating rings on top until I reach the edge. Then I smooth out the top with an offset spatula. 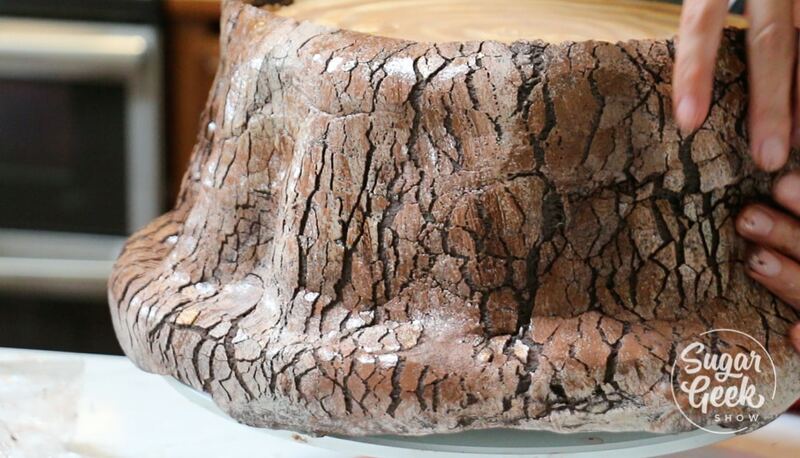 Originally I made the bark texture by placing ganache onto some crumpled tinfoil that is sprayed with vegetable oil and then wrap it onto the cake, freeze and pull off the foil but I decided to try out a new technique using my crackled fondant tutorial for a more realistic bark texture. 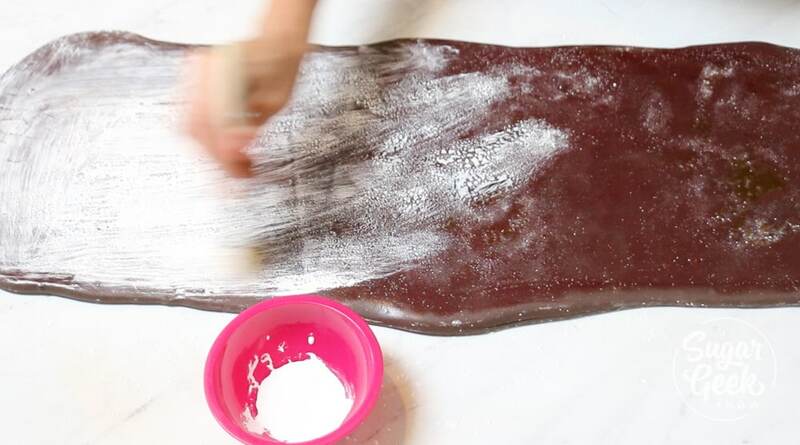 First I roll out my brown fondant into a piece that is almost as tall as my cake and about 25″ long and 1/2″ thick. I torch the surface with my blow torch then add some granulated sugar and torch that. I let the whole thing cool. Then I paint the surface of the fondant with some white food coloring and then some ivory to give is some variation. Let it cool fully. Cover the top of the fondant with some plastic wrap and roll it up. Spray your ganache with some water to make it sticky and then wrap your fondant around the cake. Lifting the fondant to make it “crack. If you get a rip or tear don’t worry, it’s bark! You can’t mess it up. Just fix any holes and push it into place. Trim off the excess around the roots and at the top. The only thing left to do is place the axe! 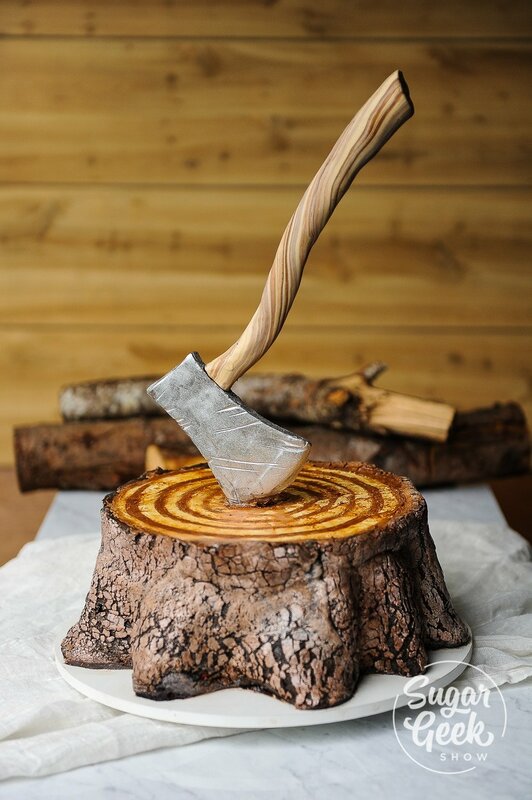 If you’re delivering this cake or traveling, don’t put the axe in the cake until you arrive. *tip: the more the handle is straight up and down, the more balanced it will be and be less prone to tipping over. That’s it! 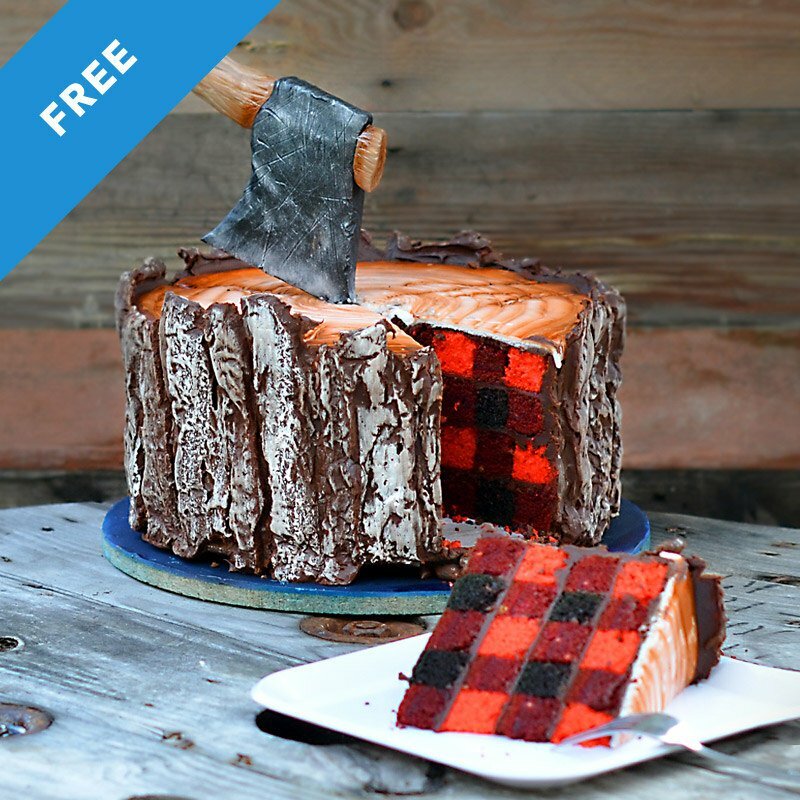 I hope you guys enjoyed this free lumberjack cake tutorial. If you make this cake, I’d love to see your version in the comments. Let me know what you think of it and if you have any issues, you can always ask me there. 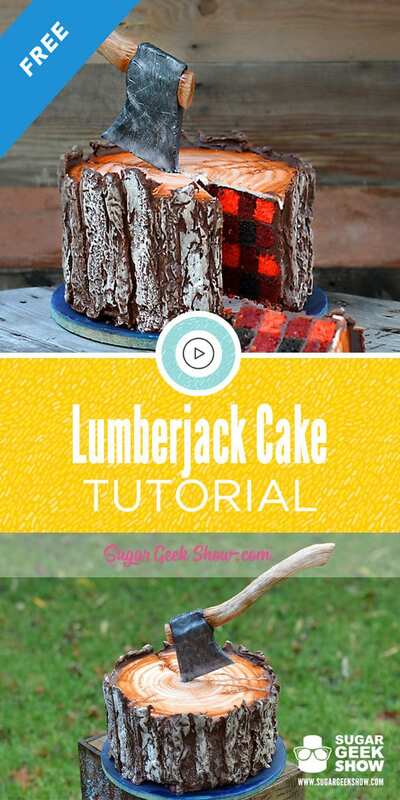 Watch the lumberjack cake tutorial at the bottom of the recipe! 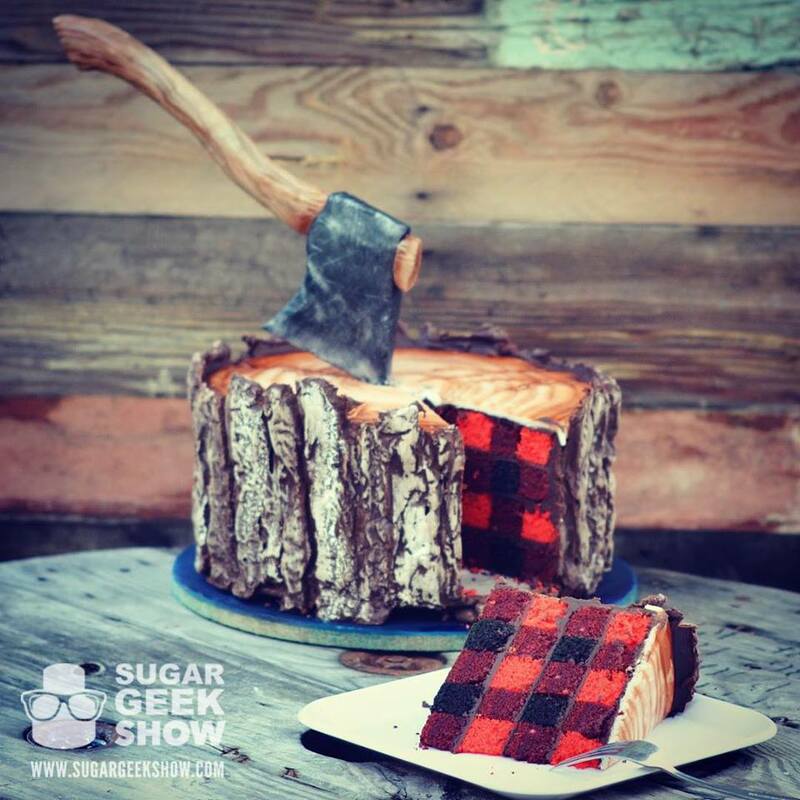 Learn how to make this amazingly awesome lumberjack cake from Liz Marek of the Sugar Geek Show. Liz is the original creator of the Lumberjack cake. 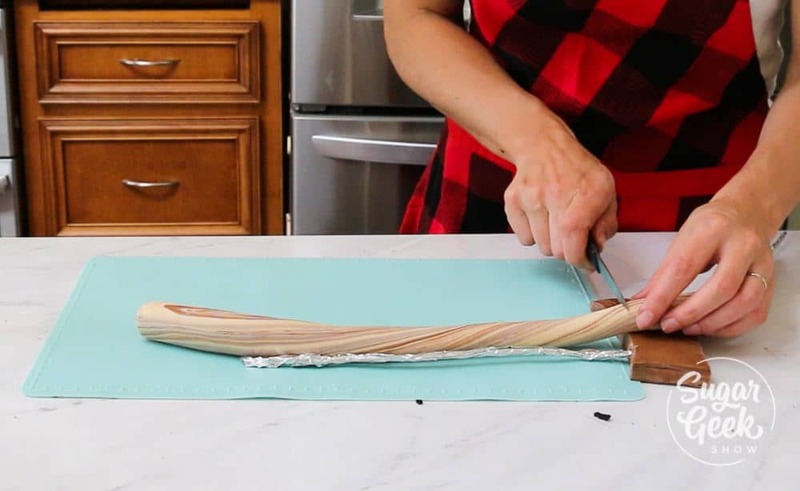 She shows us how to make the perfect buffalo plaid cake pattern inside, buttercream rings, gravity defying modeling chocolate axe and bark texture! Divide the batter evenly between the prepared pans. Smooth the tops with a rubber spatula. Bake cakes until they feel firm in the center and a toothpick comes out clean or with just a few crumbs on it, about 35-40 minutes. Chill cakes until firm before torting. With the mixer at the lowest speed, add about a third of the dry ingredients to the batter, followed immediately by about a third of the milk mixture, mix until ingredients are almost incorporated into the batter. Repeat the process 2 more times. When the batter appears blended, stop the mixer and scrape the sides of the bowl with a rubber spatula. Bake for 30-40 minutes until a toothpick comes out clean. Wrap and chill until firm before torting. Heat your cream to a simmer and pour over your chocolate. Let set 5 minutes and then whisk until smooth. If you have some unmelted chocolate, you can heat further in the microwave or over a bane marie until fully melted. Let mixture cool at room temperature until ganache is at the consistency of peanut butter. 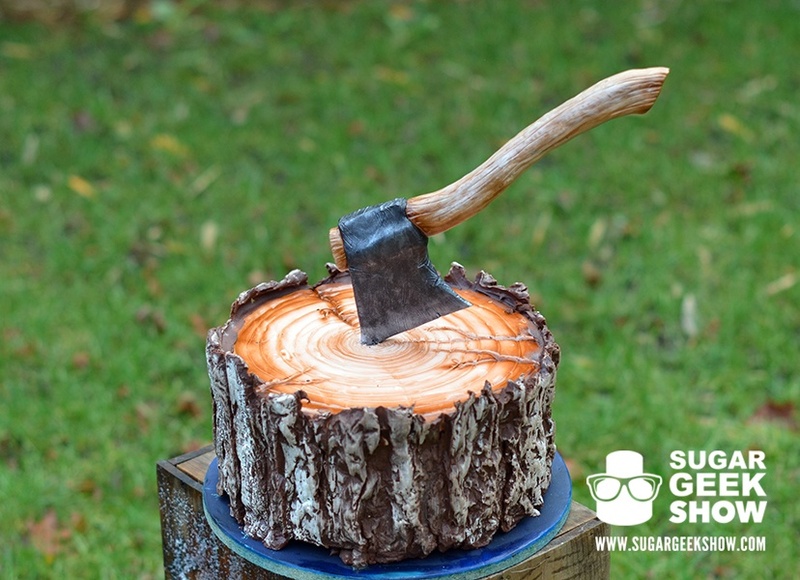 Watch the full tutorial on how to construct this lumberjack cake! Liz is the owner of Artisan Cake Company in Portland, Oregon. Published author of Artisan Cake Company's Visual Guide to Cake Decorating, winner of multiple awards in cake decorating and cake design and regular contributor to American Cake Decorating magazine. 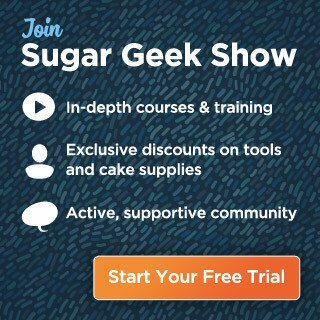 Host of the Sugar Geek Show. I love this cake, and appreciate that it is an actual plaid pattern on the inside. I appreciate you making the tutorial free. 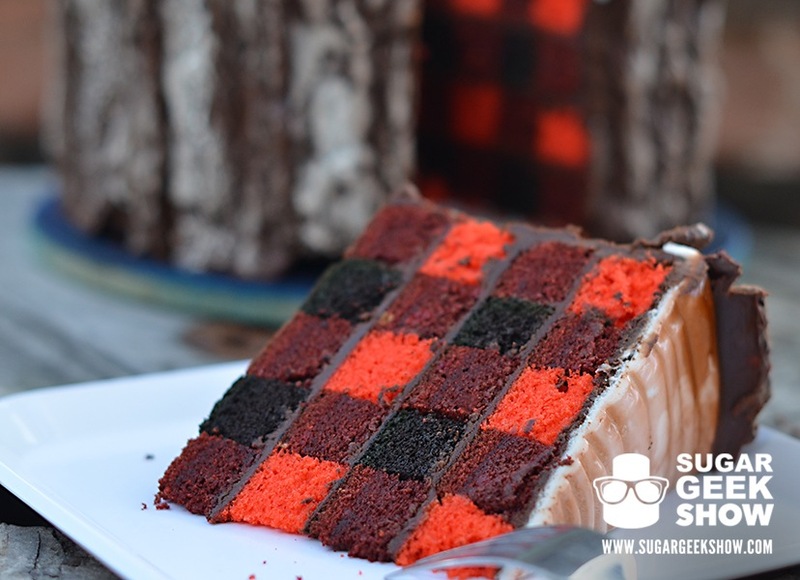 My daughter is having a red and black plaid themed 17th birthday party this fall, and I intend to attempt your wonderful creation with the original ganache bark. Is it possible to make this a day before an occasion, and if so, how and where should it be stored overnight? I have read a lot of reviews, but I haven’t seen much about storage once the cake is complete. Retaining the cakes appearance is important to me, so I want to do this right. Thank you. I store all my cakes in the fridge and always finish them a day early just in case. Hi There, Can I use your mayo chocolate cake recipe for this? Would that be sturdy enough ? Can I please ask what brand of colours did you use? I can’t find the bright red color for the cake. Is Christmas red comparable or not??? Christmas red will be a bit on the pink side. Looks amazing!! I can’t wait to try it, thank you for sharing your tutorial! Your tutorials never cease to amaze! You are an incredible artist! I want to attempt to make this cake for my cousin and I just wanted to know if it would be ok to substitute the ganache with buttercream. I’ve never had much luck at making ganache and feel more comfortable with making buttercream. I am wanting to make this pattern in a smash cake size only. How would suggest the sizes for that and cake mixes??? Thank you, thank you, thank you! 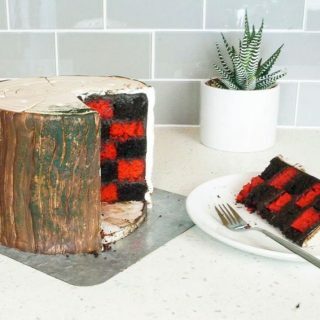 I took your tutorial of the lumberjack cake & I did! Big years and compliments. Amazing! What do you suggest for the cake color/flavor considering the chocolate helps the color more than white cake? Thank you!! I am thinking they will have to tough it out haha. Unfortunately, I married a man who dislikes the things \I love (chocolate, avocados, and tacos)! Why do you have everything listed in ounces? Gosh, I’m going to have to transcribe it all. However, in excited to make this. 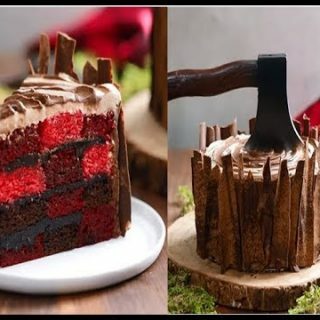 I’m making this tonight, and I’m wondering how sturdy the one single wire is to hold the axe in the cake. I am worried about transporting it! Does it seem to stay up well? I can only find Wilton icing coloring gel. Will that work? And same quantity? This is amazing and I can’t wait to try it. I love the look of the original with chocolate bark, but when I try to click the link (that says it’s free); I get to a members page. Is the original bark tutorial available to see? Thank you! 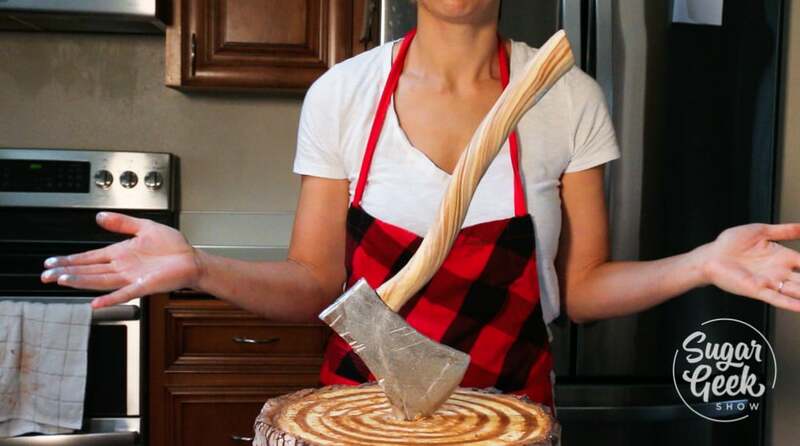 Thank you a bazillion times over for your tutorials on this lumberjack cake! I made it for a baby shower and it was a HUGE hit! I have never made a cake of this magnitude so it took me a lot longer to make it. lol. I had to make a ton more ganache because I’ve never worked with it before haha. You have inspired me to get out of my comfort zone! My next baby shower is in only 2 weeks! I’m making a pillow cake for the Royal Prince theme. I won’t wait till the day before to start the cake! Hahaha. Thanks again!!! I am making this cake for a baby shower but am only doing the plaid inside and then a simple white frosting on the outside…how well will the cake freeze with the ganache? I was thinking i would freeze it and then frost the morning of the shower. Thoughts? A cake should not be frozen solid. Think about a cold glass of water on a hot day and how much water condensates on the outside. Thats what happens to a frozen cake. Just place the cake into the fridge to keep it chilled. Could I just use regular aluminum foil to cover the wire? Having a hard time finding the tape locally and I don’t have time to order it online. Not sure where you are located but they sell it in the air conditioning department at hardware stores. If you use aluminum foil it’s not going to stick to the wire. It will just fall off.